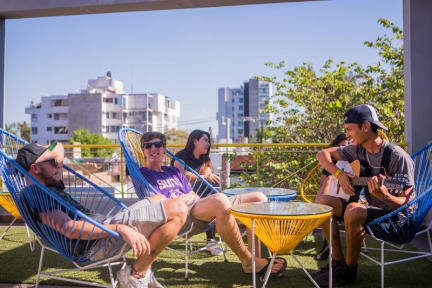 Hostal Nacional award winner / Diva Proof hostel is a great and beautiful Backpackers and Digital Nomads designed hostel, bar and terrace that offers the perfect accommodation for young people and internationals visitors traveling on a budget. Perfectly located in the most entertaining and central area of Guadalajara within 5 minutes walking distance from Chapultepec Avenue where you will find great people, day and night life surrounded by lots of bars, restaurants, night clubs, shops, galleries, museums, down town and city main attractions, Hostal Nacional is the best place to stay for those who want to spend a great time in Guadalajara. Our rooms are equipped with electronic password door locks, fans, plugs in every bed for your mobile phone, free wifi, free linens on your bed and towels for hire. We also offer you security with a personal locker and storage rooms. 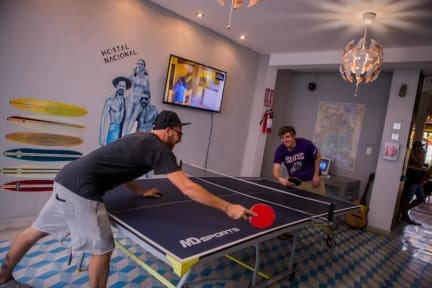 Hostal Nacional offers clean, comfortable and stylish accommodations in 5 mixed dorms and 2 private rooms, 8 bathrooms total in all the property with hot showers 24/7, great mirrors and daily activities with the best crew ready to help. Enjoy our terrace to get some tan before returning home while drinking some beers from our Hostel Bar, we are a great place to meet travelers and make new friends, the vibe and mood at hostal nacional is the best because of our nightly activities. some other facilities are also available: free wi-fi internet, Ping Pong table, Co-working space, kitchen, roof top terrace, computer with internet access and everyday cleaning of our facilities. Feel safe at our property with our closed tv security cameras and controlled main entrance. Want to meet the area, join our daily tours to Tequila magic town, Tlaquepaque, Tonalá, Guachimintones Pyramids, Chapala Lake or Guadalajara downtown, leaving everyday from hostal nacional at 10:00 hrs. Our beautiful new designed hostel will blow your mind, once you come here your hostel standards will never be the same. Hoseal Nacional can accept groups, for group bookings a different policy may apply. Check-out time for Groups: 10 am. Please note: do not offer breakfast. Remember to bring you best attitude and mood to meet nice people. Very helpful staff who go above and beyond. Vibe of the place was perfect for a solo traveller. Only complaint is the door code system which is very loud and disruptive to sleeping guest. I love the rooftop and bar this hostel. The staff is great. Really cool and friendly. Good 10-15 walk to Av. Chaputelpec where all the bars and restaurants are. I recommend Café Europa ( 5 min walk) from Hostel for some Apple Chai and delicious carrot cake. Or have some delicious brekkie at the Paloma restaurant right in front of the hostel. I would def. recommend staying here in GDL. There weren’t that many people about since it’s the off season, but there was a nice atmosphere anyway. The guests and staff were super friendly, and the Thursday bar crawl was soooooooooooo fun! About a 45 minute walk to the center of town, and there were plenty of nice food and drink places nearby. No free bfast is a miss when comparing to Hospedarte. Deck upstairs is awesome though to relax and hang out. Felt as if a lot of things were either not working or dirty. Was only there for 1 night though and didn't get to experience the bar which could definitely have upped my rating of the hostel. Hostal Nacional is colorful and convenient, close to Chapultepec, various food options, and not a far uber from the centro historic part of the city. It's social and the terrace on top is nice. There needs to be more attention to the cleanliness of the bathrooms by the staff though, and there was never really warm water to shower. A place that does include breakfast would probably be a better bang for the buck. A bit too much security. There are two gates to pass before getting in, and they also make you wear a bracelet. Dorm beds are comfy and showers are good. Wifi could be better especially on the rooftop area. Nice rooftop area. ping pong table is cool, but right in front of the tv, so kind of weird to start a game when someone is watching something. We were there in low season, not much atmosphere. Quite far from center.